Tapenade and I have a complicated history. This is my latest version of that intensely flavoured paste and it really shouldn't be called tapenade - it's a bit like tapenade's distant relative. It's more of an almond, olive and sundried tomato dip with other things in it. Very tasty and very easy, though. If my memory is to be trusted (it's probably not) the first time I ever ate tapenade was back in the 1970s. Somehow or other I'd got involved in selling 'antique' furniture and other pre-loved collectible items. I'd become the largely useless assistant to a guy who most days knew a secretaire from a settee. I said ‘antique’ furniture but I think the word we used most often was ‘tat’. Occasionally we'd get a decent piece and one day we sold a pleasant little oak table to a well-known musician. (I'm not saying who – he's still around and probably even better known now and I've got save something for the third volume of my autobiography provisionally titled ‘Phil in the Kitchen: The Lovejoy Years’). We turned up in the battered van at the musician's house somewhere in the depths of Surrey one summer evening and found that there was a party going on. We thought it was perfectly in tune with the spirit of the times to dump the table in the hall and join the happy throng. Several hours later the well-known musician discovered we were there and threw us out with nothing more than the remains of a bottle of wine and a handful of canapés to show for our trouble. He seemed to think that we were freeloaders. He was absolutely right. And so as the sun came up on the next, fine summer day we were sitting on the slopes of Box Hill (not far from where Emma fictionally attended her picnic some years earlier) eating canapés and drinking the well-known musician's wine. I remember thinking two things. First, the canapés with the black stuff on them were really unpleasant and, second, that I was determined never to buy one of his records again. Although I've mellowed on the subject of tapenade over the years, Dear Reader, to this day I have yet to shell out any cash for his recorded works. This amount works best in a small processor, although these can vary a lot in power and effectiveness. If yours isn't very powerful, you may want to crush the almonds a little first. Otherwise simply place all the ingredients in a suitable processor and whiz until you get the texture that appeals. I like it quite smooth with the occasional larger piece but most people seem to prefer a chunkier version. It's likely that the resulting paste will be a little thick and so add 1 or 2 tablespoons of water to thin it down. Finish the dip by drizzling with a little extra lemon juice and olive oil or, even nicer, a drizzle of lemon infused olive oil. Serve with toasted slices of baguette or with whatever it is that you prefer to dip into dips. Pick out some fine music and I'll see you on Box Hill for a picnic. Just don't ask me anything about antique furniture - I won't know the answer. In line with one of my new year resolutions (remember the new year?) I'm making more of an effort to share now and then. 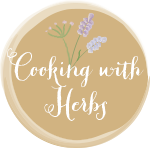 This is hardly cooking but it does have herbs so it should just about fit in with the February Lavender and Lovage Cooking with Herbs challenge. If you live along the Normandy coast, then you tend to be zealous in your search for the best, freshest fish. A good poissonnerie or market stall would both be fine but wouldn't it be even better to buy the fish straight off the boats? Which is why people descend on the little seafront town of Quiberville when the catch is in. There's no harbour as such at Quiberville and so the fishing boats, called 'doris', are dragged up the beach by tractor and the catch is sold at roadside stalls. Although you can be sure that the fish is fresh, you can't guarantee what will turn up in the catch. This recipe is based on the kind of simple, Normandy dish that will make the most of whatever the catch happens to be. You can use any firm white fish fillets of reasonable size and a mix of two or three different types wouldn't be unusual if it's intended to serve a family. Mussels are typically added to this kind of dish along the Côte d'Albâtre, although prawns might be used instead. I used prawns this time because that's what I happened to have. If you're using mussels, then it's easiest to cook them first. Just steam them in a little wine or cider and remove them from the shells. (You can leave some in their shells for decoration if you prefer, although that tends to be a bit messy when it comes to eating the dish). This works well with just some plain rice, but I love to eat it with a good baguette to soak up the juices. It might sound odd to use a chicken stock with fish but it does add a savoury quality that enhances the overall flavour. Of course, you could use a fish or even a vegetable stock if you prefer. This will serve 2. And yes I know that it sounds a bit pretentious using a French name for this recipe but it just sounds so much better than ‘White Fish Stew from the Channel’. Using a large frying pan or sauté pan with a lid fry the leek and carrot gently in a little butter until the leek has started to soften. Pour in 100 ml of the wine, place the lid on the pan and continue to cook for 10 – 15 minutes over a low heat. Keep an eye on it to make sure that it doesn't dry out. Add a little water if necessary. At the end of this time the leek should be very soft and the carrots should be fairly tender but not mushy. Remove the lid, add the mushrooms, increase the heat and cook for a further 2 or 3 minutes. Add some seasoning. (If you’re being particularly careful about the whiteness, then use white pepper if you have any). Pour in the remaining 50 ml of wine and the chicken stock. Lower the heat again and add the fish and, if you're using them, add the prawns as well. Cook very gently, stirring and turning the fish to ensure that it cooks evenly. The cooking time for this stage will vary according to the type of fish and the size of the chunks, but it’s unlikely to be more than 5 or 6 minutes. As soon as the fish and prawns are cooked, stir in the crème fraîche (and the cooked mussels, if that's what you’re using) and allow it to heat through. Serve at once, sprinkled with a little finely chopped chervil or parsley.